Are You Suffering from Back Pain, Neck Pain, Sciatica or other Nerve Pain? Are You Searching for a Safe Alternative to Surgery, Injections and Addictive Pain Medications? Relief—even from severe pain—IS possible. If you are suffering from severe or chronic pain, it can completely consume you. You are desperate for any kind of relief. Perhaps even surgery has been recommended or is an option you are considering. Back and neck surgery should always be a last resort. Complications from surgery can be permanent and spinal surgeries often require a long recovery period. One of the most scientifically advanced spinal treatments available today; The DRS Protocol™ is 94% effective in treating bulging, degenerative or herniated discs. DRS™ stands for Decompression, Reduction and Stabilization. It can offer relief from back pain, neck pain, sciatica, and other nerve conditions. It also – in many cases – is effective for treating conditions associated with failed back and neck surgeries. The DRS Protocol™ can help you get back to the activities you love – pain-free. The DRS Protocol™ decreases the irritation in your spine and reduces pressure on your nerves and discs. This helps stabilize your condition, relieving pain so you can get back to your normal daily life. By comfortably increasing the space between your vertebrae, The DRS Protocol™ mobilizes the spinal joints and re-tones your underlying musculature. Once this is accomplished many patients return to a pain-free and drug-free life. Envision a life where you return to the activities you love – walking, skiing, riding your bike, playing with your kids or grandkids, even driving. Everything you love to do, and are not able to becomes enjoyable again when you’re no longer in pain. Returning to a pain-free, comfortable life is a powerful and rewarding journey. Unable to watch the video for any reason? Prefer to read? Click here to view a transcript of Ellen’s video. Do you want to know if non-surgical spinal decompression is right for you? Call our office at 970-368-7287 or complete the form below to schedule a caring, thoughtful consultation with Dr. Auth and learn how The DRS Protocol™ can help you. Throughout your daily activities, your spine supports you while taking on the natural forces of gravity and compression. This stress on your spine caused by everyday life has a cumulative effect, which can cause your spine to be compromised. These activities may include bending, lifting, twisting, sitting, driving, reaching – even something as simple as coughing, sneezing or tying your shoes. The ongoing stress to your spine results in discs becoming damaged, causing them to weaken and tear. When this occurs, the nucleus (soft interior portion) of your disc may push through tears in the outer tissues (annulus), resulting in a disc herniation or a disc bulge. This disc material may directly press on your nerves or cause a chemical irritation creating severe shooting pain, burning pain or numbness and tingling. 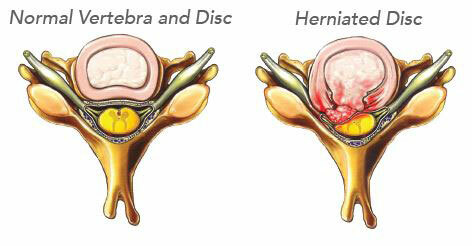 As you see in the image of the herniated disc, the nucleus is protruding through a tear and is pressing on the nerve. In order to keep the nucleus of your disc intact and functioning correctly, the outer tissues of the discs need to heal. Once this is achieved, your spine returns to more healthy state, your pain subsides, and your life can return to normal. How does the DRS Protocol™ return your spine to a state of health? The DRS™ Protocol is both relaxing and comfortable as well as safe and drug-free. Unable to watch the video for any reason? Prefer to read? Click here to view a transcript of The DRS Protocol™ for the Cervical Spine video. Unable to watch the video for any reason? Prefer to read? 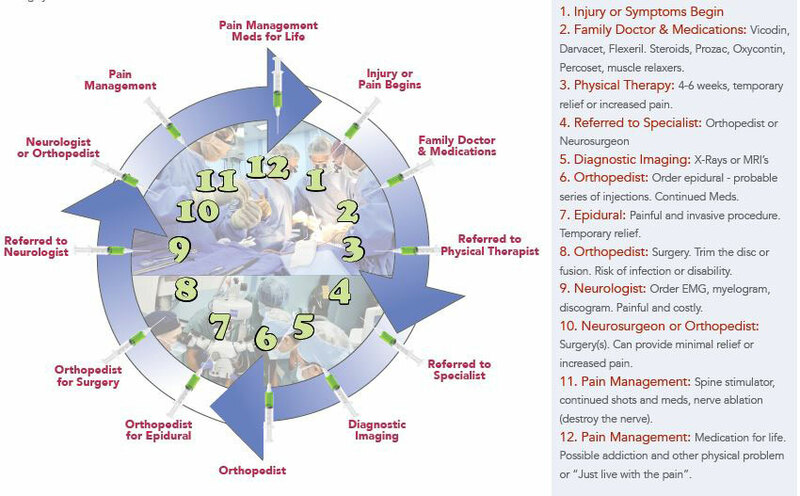 Click here to view a transcript of The DRS Protocol™ for the Lumbar Spine video. Do you see yourself anywhere (or everywhere?) on the Pipeline? If so, chances are, you’re a candidate for The DRS Protocol™. If you’re thinking, “Yes, that’s me,” we suggest you call our office at PHONE and schedule a consultation. Dr. Auth will conduct a detailed and thorough examination to determine whether The DRS Protocol™ can help you. If you qualify, Dr. Auth will create a specific treatment plan to address your particular needs and conditions. Dr. Auth’s goal is to keep you out of the pipeline and return you to a symptom-free, comfortable life, able to do the things you love. The DRS Protocol™ is tremendously successful. Dr. Auth has been where you are today. One of the main reasons Dr. Auth brought The DRS Protocol™ into his office was to treat his own spinal conditions. Every aspect of treatment is designed to relieve your pain or symptoms and help you heal. A 94% success rate is an encouraging benchmark. Thousands of patients have experienced dramatic relief and healing through The DRS Protocol™. Terri, diagnosed with spinal stenosis, had tried conventional chiropractic care, but found the effects were temporary. The DRS Protocol™ has improved the quality of my life and I would recommend it for anyone suffering from chronic discomfort. Mike was a firefighter who had an accident on the job, resulting in chronic pain. He was seeking a natural treatment for pain relief and to avoid surgery. Dr. Auth diagnosed Mike with spinal stenosis and recommended non-surgical spinal decompression. Mike describes his experience as incredible. He has quickly been able to return to the active lifestyle he loves. The DRS Protocol™ has completely taken surgery out of my thought process – The DRS Protocol™ has given me great results. Unable to watch the video for any reason? Prefer to read? Click here to view a transcript of Mike’s video. A colleague referred Vicki, a ski instructor at Copper Mountain, to Dr. Auth. She had been suffering from degenerative disc disease for ten years. Vicki had tried physical therapy, acupuncture and steroid shots. None of those treatments had any lasting effect for her. If like I have, you’ve tried other things, please consider The DRS Protocol™, it’s well worth it. Everything else was just a Band-Aid. Unable to watch the video for any reason? Prefer to read? Click here to view a transcript of Vicki’s video. Are you ready to experience relief from pain like Ellen, Terri, Mike, and Vicki? Call our office today at 970-368-7287 or complete the form below and we will respond promptly.